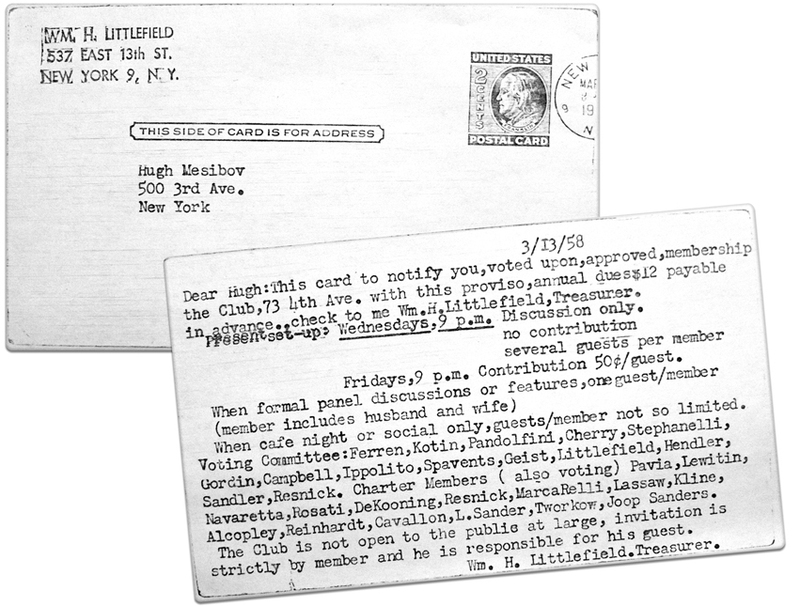 This Card signified Hugh Mesibov's membership in the storied and exclusive Greenwich Village artists club. "The Club", which was a group of Abstract Expressionist artists, who met for a time at the famous Cedar Tavern in Greenwich Village, held weekly meetings that included panel discussions and lectures. They were a rowdy, intellectual crowd, socializing, drinking, arguing and occasionally fighting. "The Club" became extremely influential in the lives and careers of the New York School of artists. Historians consider it an important incubator of the Abstract Expressionist movement. Some of the members included Jackson Pollock, Willem de Kooning, Mark Rothko, Franz Kline, Robert Motherwell, Ad Reinhardt, Aristodimos Kaldis, Phillip Guston, Al Leslie, Michael Goldberg, Landes Lewitin, James Brooks, Charles Cajori, Mercedes Matter and others of the New York School.